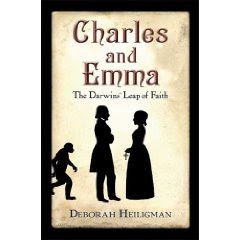 Charles and Emma: The Darwins' Leap of Faith by Deborah Heiligman. Henry Holt & Co. 2009. Review copy from publisher. YA Nonfiction. National Book Award finalist; on the shortlist for YALSA Excellence in Nonfiction Award. About: Charles Darwin had faith in science; his wife, Emma Wedgwood, had faith in religion. Despite having opposite beliefs on the role of God in science as well as life after death, the two married and had a long, happy marriage of mutual support and love. How? The Good: I adored this book! I love the look at real people in history, even it always makes historical fiction that much harder to read. Darwin's research and writing process is presented in a way that makes sense to the non-scientist. Darwin and Wedgwood (as well as their family and friends) left so much written documentation behind (books, journals, letters, notes) that Heiligman never guesses to thought process or motivation, footnoting the source for each he/she said/thought. Because "how real people really lived" intrigues me (as opposed to "all Victorians thought and did thusly") I was especially interested in the details of housekeeping, in the most literal sense of the word. Here was not just a marriage full of love and respect; here, too, was a family that was warm, affectionate, supportive. And I loved the message -- people can disagree and yet still love and respect each other. Darwin believed that God played no role in natural selection or evolution; Wedgwood (religious but not a literalist in her belief) disagreed. While they argued the point, it did not control their lives, their love, or their relationship. The trust was such that Wedgwood read and edited Darwin's work, noting what needed to be clearer to a nonscientific reader or more persuasive in supporting his arguments. The good thing about a nonfiction book for young adults is that they are usually shorter than adult nonfiction. The bad thing is they are usually shorter than adult nonfiction. Often, in Charles and Emma, I was wanting more; more information on the family and friends of the Darwins. All those cousins, intermarrying! And all the rather impressive members of the Darwin/Wedgwood family. More information on the children. A modern theoretical diagnosis on what illnesses Darwin and his daughter Annie suffered from. What, if anything, they thought about social issues going on around them. Because I read this is 2010, it's on my favorite books read in 2010 list. (see sidebar). Even tho it's a 2009 title. It occurred to me that PBS or the BBC should consider doing a Darwin-Wedgewood drama series. There is so much historical material available and so many fascinating facets of Darwin's work and relationships to explore. I loved the bits about the children. It was so nice to see a (real!) Victorian family with kids running all over the place and jumping on the furniture. I loved the bits about the kids as well - it very much made Darwin a more human figure to me; someone I could relate to better. I often wondered about their marriage though and most books on him (for kids or adults) focus so much on the Beagle and not on his homelife when he was working on the book. I learned a lot from this book which is saying something - I think I've read a dozen books on Darwin to date so finding something new is great. Thanks for the review. I've heard so much about this book and am looking forward to reading it. I've been eager to read this book and your review only makes me more so. The only problem is that it would be a hard sell at my school. I cannot seem to get my students interested in biography. I've worked on weeding out the truly boring ones, but the only time they venture into the biography section is when they need something for research. I loved this book too, especially how it made Darwin and his family feel so real. And I would love to watch a Darwin/Wedgewood drama series! Have never heard of this book but, as this sort of thing is going on in our own marriage I'm totally thrilled to hear about it! Thanks for the review, I can't wait to pick it up! Wish they'd do a more detailed version for adults! Liz, talk about reviews that make me want to read the book, boy howdy! Ran directly to the library website to put it on hold. Thanks. Fran & Sarah, a PBS/BBC production of the Darwin/Wedgewoods would be made of awesome. Jennie, it's so great to read how real families were not like the stereotypes. In so many ways, the Darwins didn't fit any "all Victorians are x....". It's why I love nonfiction. Colleen, I hope the Bettany film gets released here. Paige, biographies are definately not for all kids, so I think its about matching the books with the small group of kids who will love it. The teen appeal here, I think, is the tension of the marriage with these two having what would seem a huge divide between them, only not. "Imagine being in love with someone who disagrees with you about the most fundamental things in the world...what would you do?" Teens are sorting out relationships, etc. Vivian & Kidsbookjunkie, after you've read it, let me know what you think. Carlie, the good thing about YA NF is that I can finish it in a few days, as opposed to adult nonfiction which is twice the length with smaller font. The bad thing is I get to the end of the book and want more... more about educating their children, more about the love they had for each other, more about family and friends (some wikipedia searches revealed some stories of friends/families that an adult book would surely address). Melissa, I hope you enjoy it! I especially like how the author really balances the viewpoints of Charles & Emma and respects both. And thanks for the link from your blog! Liz, I liked this book when I read it last year, but I wonder what it has to offer young readers. Looking back at my own blog post on the book, I see that Charles and Emma were thirty when they married and a lot of the book deals with them as being sickly and middle-aged. I can't see a lot of kids finding them intriguing people. Gail, I see this for the over 14 crowd. The teen appeal: despite their ages, here are two people trying to figure out how they can disagree over something significant yet love each other and be together. Teens who are falling in love, finding their own path, will be interested in that, I think. While the Childhoods of Famous Americans series was built around the idea that kids want to read about kids, I also think teens interested in history will not limit themselves to only reading history that is about or involves teenagers.